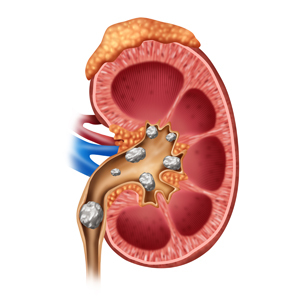 Kidney stones occur when hard deposits of mineral salts form in the kidneys. The stones are formed when minerals in highly concentrated urine crystallize and combine together. Kidney stones affect all parts of the urinary tract. However, they do not cause permanent damage if they are noticed early. Passing kidney stones is very painful. In many instances, the only remedy for kidney stones is pain medication and consumption of lots of water for easier discharge. However, there are cases when the stones get stuck in the urinary tract leading to complications. In such instances, surgery is needed. Calcium stones. Calcium stones are the most prevalent kidney stones. They are usually in the form of calcium phosphates and calcium oxalates. Oxalate is found in food and is also produced by liver on a daily basis. Struvite stones. They form as a response to an infection. They grow quickly and if left unattended to may lead to serious problems. Cystine stones. Hereditary disorders, which lead the kidney to excrete excess amino acids (cystinuria), lead to the creation of these stones. Uric acid stones. They occur to persons who do not take enough fluids. Family history. If your family suffers from kidney stones, then there is a high chance you may develop them too. Diets high in protein, sugar and salt are linked to kidney stones.